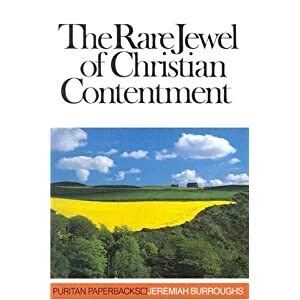 I have been immersed in the Rare Jewel of Christian Contentment by Jeremiah Burroughs now for almost 2 months and it has been extremely good for my soul. Two themes in particular has been huge: that this world is truly not my home and that the world of eternity promised to us in Christ will be better than I can fathom. These past few days I played Mr. Mom as my wife helped out with our local twins club and their biannual used kids sale. The first day I was amped up and motivated, vacuuming almost the whole house and doing some outside work around our house as well on top of taking care of my 5 little ones. It was an enjoyable day. The next day I was feeling it. I was struggling to get moving in the morning. But, the day went well and I felt like I was able to delight in my kids and even made a fun dinner for them. Day 3? I was toast. Of course, my kids were tired and cranky as well. I was struggling to delight in them, to joyfully serve them, to not fall asleep. Fatigue and my own selfishness fought to taint everything on day 3 without my wife. I honestly was trying to trust Jesus to sustain my but I was exhausted. I almost couldn’t think straight and was starting to become harsh with my kids as Hyde was screaming to take over. How did I finish the day? I started to put my hope in when my wife got home and my time with her! The evening went pretty well because I was simply looking forward to her. It tainted everything I did from that point forward. I thought about what we might do together and even had some sparkling wine ready to enjoy together. Thinking about my wife impacted the rest of my day and helped carry me through the fog of exhaustion. The reality is, due to circumstances out of her hands, she got home later than we both thought and, by that time, we were both walking zombies (date night tonight though!). This anticipation plays out many a time though. It can affect my wife’s entire week to know we have a date night coming. On days we have a date night, my work day flies by and I have an anticipation that can carry me. Eternity should be like this for us. Everything we end up hoping for in this world can carry us only temporarily and can disappoint. This is not the case with what Jesus has stored up for us. We know that one drop of sourness, or one drop of gall will make bitter a great deal of honey. Put a spoonful of sugar into a cup of gall or wormwood, and it will not sweeten it; but if you put a spoonful of gall into a cup of sugar, it will embitter that. Now it is otherwise in heaven: one drop of sweetness will sweeten a great deal of sour affliction, but a great deal of sourness and gall will not embitter a soul who sees the glory of heaven that is to come. A carnal heart has no contentment but from what he sees before him in this world, but a godly hearts has contentment from what he sees laid up for him in the highest heavens. There is a great deal of hope in these thoughts from Burroughs. We who trust in Christ do indeed have a light at the end of the tunnel and it is a glorious light. There is land ahead of this journey on the sea and we will get there. It feels so far away as the world and trials beat down on us but it is there. In hoping for heaven and eternity, God will use that anticipation to give us the joy and contentment we need to thrive and not merely gut it out in the here and now. This life can be complex and feel like the walls are caving in. Simple tasks can be painful. The rug can be pulled out from beneath us so quickly. But it will not be this way forever. This world is not our home and we are just passing through.